I took this pictures because it was his first snake tattoo and really wish I had taken more because you can barely see it. Unfortunately I do not remember where we were that my son got it. It is obvious to me that his sister was not there because there is only one picture taken this day and it was this one. Part of me thinks it was a birthday party for a friend. While I don't remember where we got it I remember how careful he was not to smear it. The girl who painted it told him to be very careful until it dried. He held his arm like this all the way to the car and when I went to put him in his car seat he reminded me to be careful and kept looking at it as I buckled him in. He is still just as careful when he gets something. When we got home there was a small smear at the tail and he wanted it off. 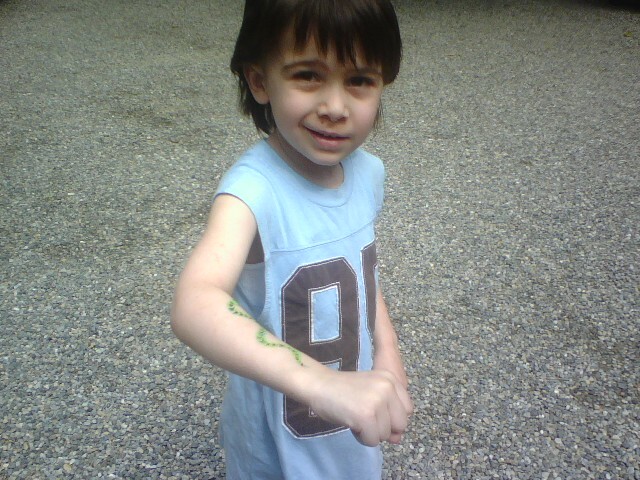 He would love a snake tattoo on his arm now and I wonder if he will ever really get one when he is older. He has told us for the past 6 years that when he is 18 he wants a tattoo. It will be interesting to see if he still feels like that when he is 18.